I have been working hard at using my scraps up. The month of Sept was Orange for the Rainbow Scrap Challenge 2012. On Saturday I really wanted to make some Pumpkins, before the month ended. But into what? I got making six pumpkins and thought maybe place mats. 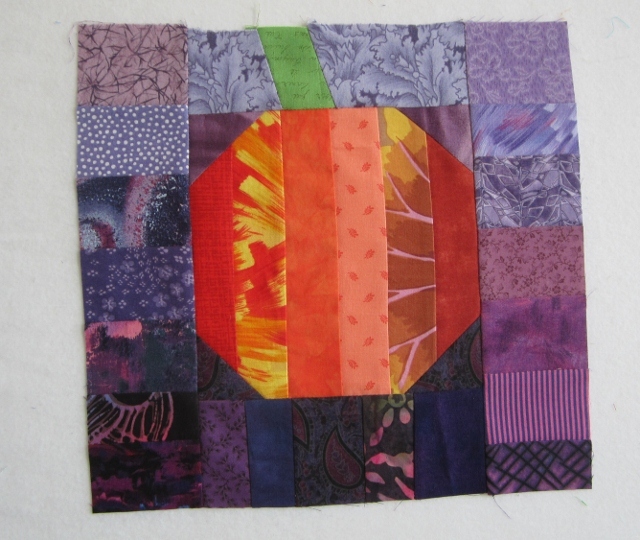 From my Orange 1 1/2" strips I made a 6 1/2" square. You would need 5 strips measuring 1 1/2" x 6 1/2". 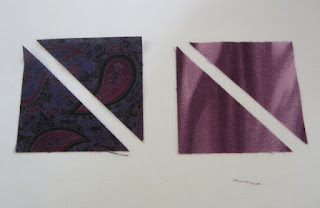 Then the corners I used Purple scarps. Start with a 2 1/2" square one dark purple and one medium purple, and cut then on the diagonal once each. The purple triangle should cover all of the orange corner. If you have it correct, trim off the orange corner and press. Trim up your pumpkin square again to 6 1/2". For the stem I used 2 inch strips and free cut them with a little angle. make sure your three pieces have the same angle. When sewing the angle, I just eyeballed the little 1/4" to hang over. Press and see if your new strip is straight enough to get by. Add your stem to the top of your pumpkin. I like to keep the medium purple on the top. Yes I did some one with the stem on the dark end and ribbed to fix it. 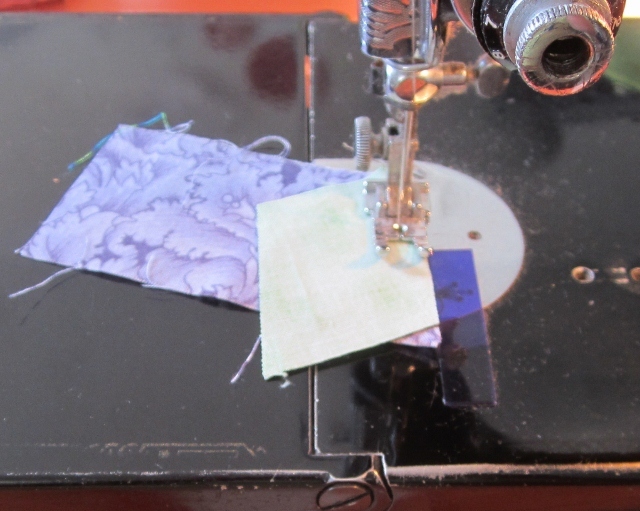 I then sewed some purple 2 1/2" scraps to make up the frame parts. 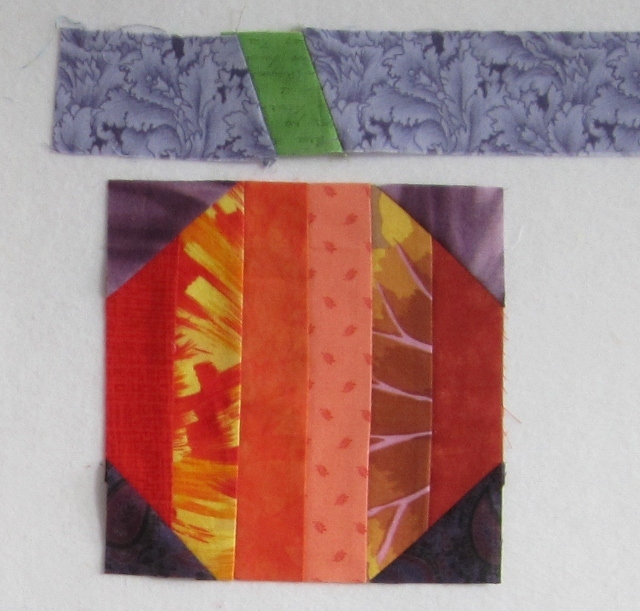 I quickly went to my longer strips and did strip piecing with my 2 " wide strips. 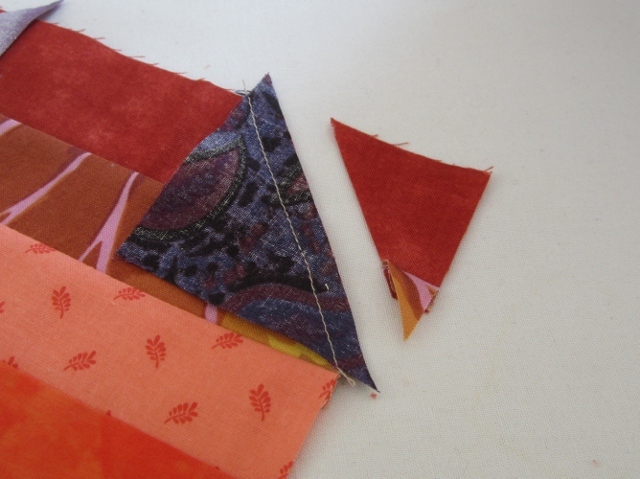 I cut off 2 1/2" strip piecing at this time. I used all dark purple on the bottom. then the sides have a little shading to medium purple. This block is now 8 1/2" wide and 8" tall. Not a great size to keep track of but I was being a little free at this time. I made the word "Boo" with all yellow scraps that were 1 1/4" wide. I had all this yellow hand dyed in my scrap box and did not cut any extra. 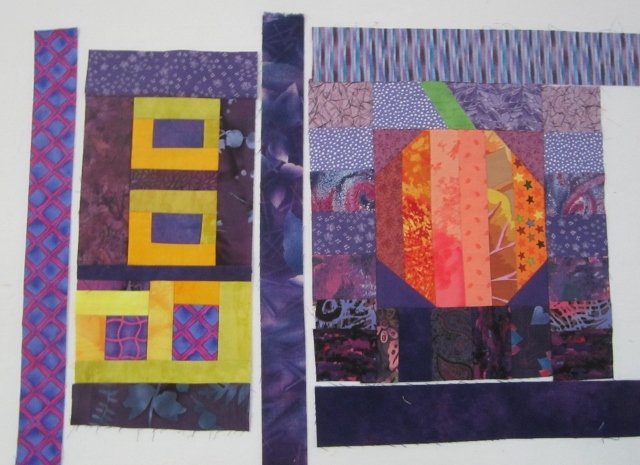 The B started with a 2" purple square for the top of the B and a 2" by 2 1/2" unit in purple. The O's started with a 1 1/2" by 2 1/4" purple unit. I then just added the yellow were needed. The top of B needs a little strip of purple, to make it as wide bottom. I added narrow strips between the letters and some purple on the top and bottom of the Os to make them as wide as the B. Lots of 1 1/2" purple strips were used to get what I needed and then I would trim of one was to big. I am sorry I did not take photos of the Boo in process. To get both the Boo's and pumpkins together I added 2 " strips to the pumpkin top and bottom. the Boo's got 1 1/2" strips around it. I trimmed if one was to big. There one place mat top done. It measures 12 1/2" tall and 17 1/2" wide. I thought that was a good size for my place mats. 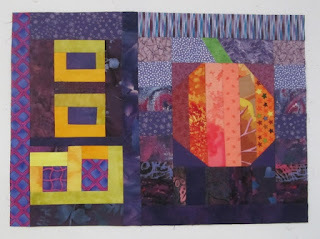 I can not lye I had to cut a few dark purple strips to finish the place mats off, but I used so much up. 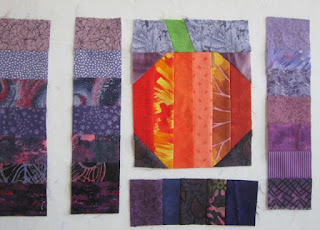 Now for some quilting these up. Blogtocberfest is going on this month and I am going to make a creative post every day this month. 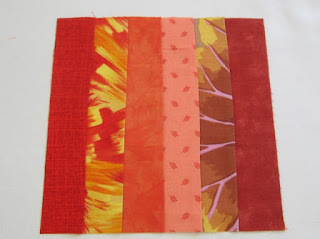 Great idea to make placemats and it looks fantastic. 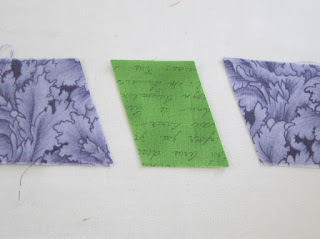 Before I got reading this post I saw the little BOO mat and thought that would be a nice gift for a friend and wondered if there was a pattern... THEN a tutorial! Thank you so much! 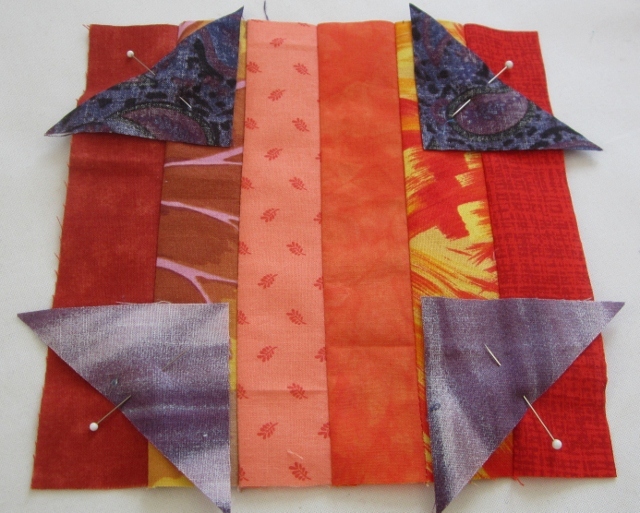 I am headed to the sewing room to see if I can make one this afternoon! Love the placemat! 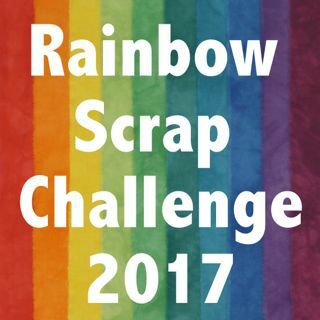 Good for you to use scraps and make it up! oh very cute seasonal mats!! Thanks for linking up to wip Wednesday this week where I've enjoyed guest-hosting!